Brantôme is a medieval town situated on the banks of river Dronne, which attracts a large number of tourists. The town is located 20 km north of Perigueux. In the "Venice of Périgord". An ideal property for 2 people looking to escape the hustle and bustle of everyday life, situated on the edge of Brantôme which is a medieval town situated on the banks of river Dronne and attracts a large number of tourists.This tastefully renovated and exquisitely furnished apartment is located on the outskirts of Brantôme, which stands on a hill with a panoramic view. The house is situated on a beautiful 3 hectare property. It is worth noting that the owner also lives on the same property with his donkeys, chickens, ducks and sheep, the animals do lend this beautifully situated property a special charm. The garden and the swimming pool with a terrace offer an unforgettable view. The considerate owners will, of course, offer any help you may need. From the garden, a path leads downhill to the centre of Brantôme, which is just 400 metres away. The town is located 20 km north of Perigueux. In the "Venice of Périgord", you will find France's oldest bell tower, a beautiful Abbey and a lively town centre with restaurants and small shops. The quiet river Dronne is ideal for canoeing or kayaking through the Perigord region. Can be booked with FAD271. The agent has rated it as a four star property so it is a well-equipped villa with above average furnishings. It is also great value for money. 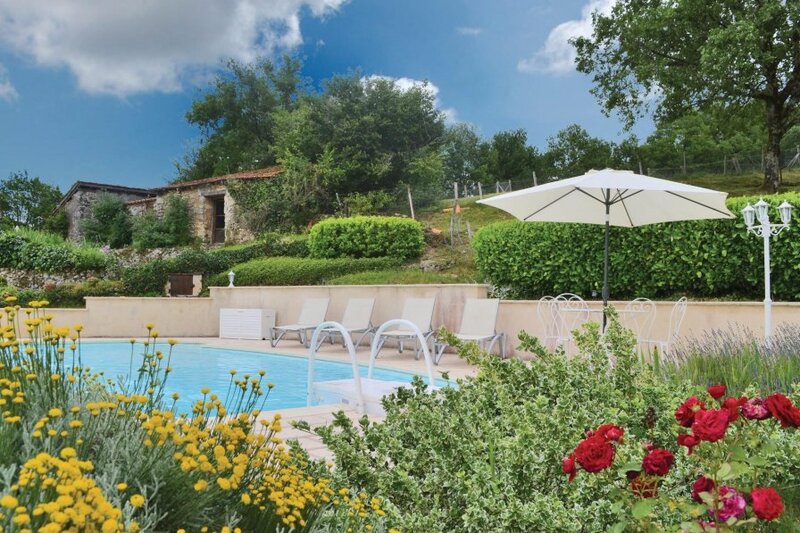 This villa has use of a shared pool and is located in Brantôme-en-Périgord. It is set in a good location: there is a restaurant only 400 metres away.